The Bills played their first preseason game against the Carolina Panthers, and in spite of the 28-23 loss, several Bills impressed. Some might say that Nathan Peterman, AJ McCarron, Josh Allen, Kelvin Benjamin or Marcus Murphy impressed them the most. 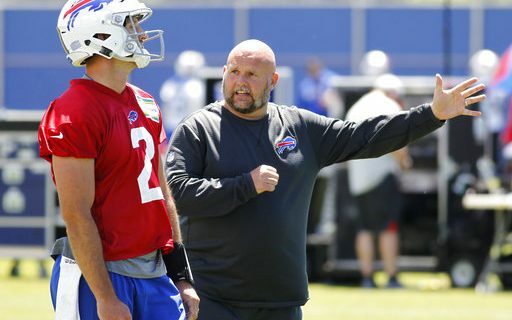 My feeling is the MVP so far for the Bills is offensive coordinator Brian Daboll. The Bills have had only three offensive coordinators since Ted Marchibroda that I have liked. Chan Gailey, Greg Roman and Anthony Lynn are the three play callers that I have really enjoyed since the Kelly years. Problem is there is a longer list of offensive coordinators that have been terrible. Last year Rick Dennison may go down as one of the worst. His inability to tailor an offense to Tyrod Taylor or anyone else on the offense led to near disaster at times. Daboll seems to be the complete opposite of Dennison. Thank God! Daboll spent years with Bill Belichick and you can see the Patriots offense in the first pre-season game. There were plays where there was a ton of confusion on one side of the field but that was just to run a play to the opposite side of the field. The Patriots do this all the time. What I’m saying is that you saw imagination from the Bills offensive coordinator. Imagine that! A second thing that impresses me about Daboll so far is his philosophy that you need to do everything well. The Bills, I feel, will tailor a game plan to the opposing defense. If that means one week being run heavy and the other week pass heavy then so be it. I like more than one system. You need to do everything well at some point in the season to adapt to your different opponents. A third area where Daboll impresses me is looking for favorable match-ups. In the first series you saw Daboll call plays for Kelvin Benjamin. Benjamin had a favorable match-up against former Bill Kevon Seymour. Benjamin schooled Seymour in the first series that finished with Benjamin catching the first touchdown of the game. But looking for good match-ups each week looks to be an area of strength for Daboll. All three Bills quarterback threw for over 100 yards in the first pre-season game. Even more impressive the Bills yards per attempt was 9.32. Why is that impressive? In the last 10 years the Bills have only had 5 games where their yards per attempt were over 9 yards. I’m don’t want to put too much stock in a preseason game. But what I’ve seen from training camp so far, and in the first game, I like in terms of Brian Daboll. If this continues this will be the number one upgrade on the offensive side of the ball from last year. Going from Rick Dennison to Brian Daboll so far looks like a major upgrade. In fact I would argue that it’s the most important upgrading the Bills made in the entire off-season.